Wheat-dogg’s World is funded out-of-pocket by its editor and creator, as its costs are quite low. That said, donations to pay for hosting fees (about $70 a year) are always welcome. Beginning in April 2016, each post will end with two donation “buttons”: one for PayPal, which will automatically link to the PayPal payments page, and a button for Bitcoin donations. The default payment using PayPal is $5. If you want to send a different amount, please use the PayPal button in the right hand sidebar. If you’d rather send Bitcoin directly, each post will also end with a QR code (a 2-D barcode) and the site’s Bitcoin address or some other plugin. Here’s how to use them. I’m assuming you already have a Bitcoin wallet or app at hand. If not, read further. If you have a Bitcoin wallet on your computer. copy and paste the Bitcoin address under the QR code into the SEND field of your wallet. Enter whatever amount you please, and confirm the transaction. If you have a Bitcoin app on your cellphone, scan the QR code with your phone, enter whatever amount you want to donatem and confirm the transaction. Please note that these Bitcoin transactions are anonymous, so I will have no idea who contributed unless you embed a message with your donation, or send me a separate email about it. PayPal, on the other hand, records the sender’s email, so I can acknowledge receipt later on. What if you don’t have or use Bitcoin? Then you need to get a Bitcoin wallet — the generic term used for a Bitcoin application or website that stores and manages your Bitcoin holdings. Bitcoin.org maintains a list of Bitcoin wallets for PC, Windows, iOS and Android. Personally, I use Ethereum on my PC, Bitcoin Wallet on my phone, and Coinbase for my web-based wallet. Once you have a wallet, the next step is to get some bitcoins by exchanging dollars (or whatever currency you use at home) for bitcoins. This involves either creating an account on a Bitcoin exchange, finding someone on localbitcoins.com who will sell you bitcoins, or asking a friend who already uses Bitcoin to send you some in exchange for fiat money. Some cities, like Hong Kong and Singapore, have Bitcoin ATMs. I use two online exchanges, BTC-China and Coinbase, for my Bitcoin/fiat exchanges, but of course there are many others to choose from. Coinbase, while technically not an exchange, does allow you to buy and sell Bitcoin for dollars, using a bank account or credit card. Most other exchange work the same way. What else can you use your Bitcoin wallet for, besides sending me tons of money? Bitrefill.com allows you to top off your prepaid cellphone service with Bitcoin. All you need to do is select your provider and the desired payment, and it does the rest. 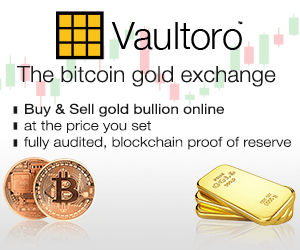 If you’re a gold bug, you can set up an account with Bitgold.com and purchase gold in any amount using Bitcoin or other methods. Merchants may have Bitcoin POS terminals at the register. It’s not especially common, but look for the orange Bitcoin B symbol, or you can ask. Why use Bitcoin at all? Transaction costs are very low, usually no more than 1% of the amount being transferred. That means you and/or the recipient are getting more of your money’s worth. The transactions are also anonymous, and secure, since each wallet generates its own unique address. No matter what donation method you use, thanks for your support! Other cryptos are available, too!